August is prime time to get ready for any holiday you have planned! Sun screen..check! Beach towel...check! But have you got a pair of flip flops ready? If you have an old pair that needs some love, Maxine has the PERFECT tutorial for you to transform them with with a few crafty goodies! 1. If your flip flops aren't new, give them a wipe before you start. 2. Using the First Edition Fruit die set, die cut the banana die using the yellow foam. Die cut the cherries and apple in red and green. 3.Cut the red cherries from the stem and layer onto the green ones. 4. Cut the stalks off the red cherries and adhere to the centre of your green cherries. 5. Stick the fruit to the front of the flip flop. TIP: Use a strong adhesive to secure your die cuts and buttons. 6.Adhere the buttons along the sides of the flip flop, next to the die cut fruit. 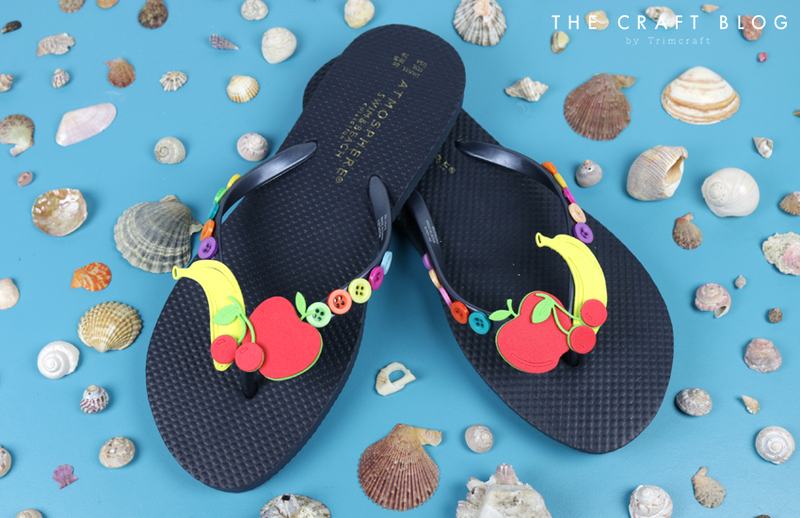 You can't get more tropical than this with your flip flop design! How great will it be knowing you've designed your own fancy footwear?! How will you use Maxine's idea? We'd love to see so don't forget to #trimcraft when uploading to social media and to share your makes in the Inspiration area!